About the Author: Coach Steve Woods served in the United States Air Force for 21 years where he wrestled for ten of those years. In addition to wrestling for the Air Force he was also a U.S. National Team member and a resident athlete at the United States Olympic Training Center, Colorado Springs, CO from 2000-2004. From time to time I hear wrestlers, parents, and sometimes even coaches complain or make observations with regards to the number of dedicated wrestlers on one’s junior high or high school wrestling team and or the lack of quality training partners who actually care and are passionate about wrestling. A complaint or observation, which is valid in a sense. Although our sport is an individual sport, we rely on others to drill and practice our moves. Not having quality training partners of the right size and caliber makes it difficult for most to progress when so much of what we do is dependent on having good partners. Lack of quality partners who share the same passion for the sport of wrestling can be very challenging to one’s own success and development. My assumption is that this is just as problematic in bigger schools as it is in small schools and the same for rural schools and even metropolitan or urban schools where a variety of factors contribute to the lack of interest in our sport. I often try to help people understand that people who get into wrestling have their own motivations for wrestling, and we cannot fault them for having their own motivations and or not sharing the same passion for wrestling as we do. However, there are some things we can control and focus on in order to get better, and build others up around us, despite not having the best or most ideal training environments. I will get into those recommendations a little further on, as I want to share my own experiences coming from a small urban school in Indiana where football, basketball and track which were hallmark, to finishing my career, 17 years later in the finals of the 2004 Olympic Trials mini-tournament in Indianapolis, Indiana. I often reflect back to my earlier days of wrestling in high school (starting as a freshman) to finishing my career as a top ranked wrestler in the United States on the senior level. In high school my wrestling coaches were the football coaches who had never wrestled, but did us a favor by at least sitting in on our practices so our underserved school could have somewhat of a program. I was one of the few who really cared about wrestling on my high school team as most others could care less about practicing, training hard, winning, or wrestling beyond high school. When I joined the Air Force, I found opportunities to wrestle in Europe and I even formed a local Air Force base team to participate in local base tournaments. However, not everyone on the team shared my passion for wrestling. Luckily for me I got the attention of then Air Force wrestling coach; Richard Estrella and I tried out for the Air Force wrestling team. Coach Estrella was rebuilding the team after it fell apart during Operation Desert Storm. And although some of my teammates had passion for wrestling, our program required a cultural shift from being a team that accepted the status quo to a competitive team that demanded an intense focus for training and competing with relentless intensity (the motto of our former Greco-Roman National Teams Coach, Steve Fraser, (1984 Olympic Greco-Roman Gold Medalist). That being said, it took some time to change the culture of the team and the attitude in how we would approach wrestling. The cultural shift that occurred eventually led to us achieving great success on the national stage as a team and as individuals. 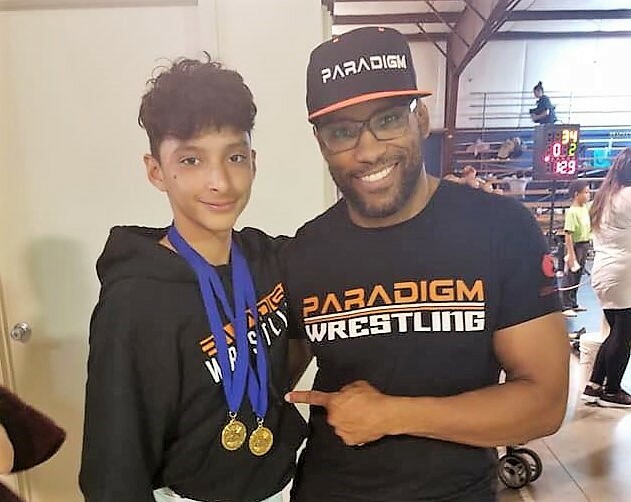 My experiences have taught me , that although the onus is on the wrestler, it takes a collaborative effort between wrestlers, parents, and coaches to create the ideal training environment and conditions that will help wrestlers achieve success. Below I outline what wrestlers, parents, and coaches can or should do. Inspire and encourage others through positive peer leadership to become better and more dedicated to wrestling inside and outside of the season. Facilitate casual discussions with teammates on what the team’s goals should be and how the team will work to support and accomplish those goals. Set the tone and example for how the team should act in practice, outside of practice in competition (at duals and even at tournaments). Watch wrestling videos on YouTube and even subscribe to FloWrestling to learn as much as one can from the wealth of information that is available on how-to do certain moves or just studying competition film on thousands of wrestlers who compete at all levels nationally and internationally. Join a club program outside of your high school team to supplement your training and further develop both in the off season as well as in season. Wrestle and compete in both freestyle and Greco-Roman wrestling tournaments in the summer. Take private lessons with quality wrestling coaches to work things specific to one’s development. Attend the best wrestling camps and clinics you can afford and travel to. Choose camps that can help you develop in the areas where needed. Recruit a teammate to be your training partner or training buddy and hold each other accountable. Develop SMART goals and communicate them to your parents, coaches and even training partners and let them know why they are important to you and how they can support those goals and how they can help you achieve those goals. Sign your child up for a wrestling club that focuses on performance and provides adequate supplemental training. Send your child away to quality wrestling camps and clinics over the summer and during the season when possible. Wrestling camps held at universities tend to have an intense environment that is hard to emulate in most wrestling rooms. Camps and clinics not only provide quality coaching and instruction, they provide multiple partners from all over as well. Recruit training partners from other high schools, wrestling alumni and even universities when possible. Turn your garage or another suitable space into a small wrestling room with wrestling mats and other training equipment if it is feasible. Inspire the team through positive leadership to become better and more dedicated to wrestling inside and outside of the season. Facilitate a discussion with the team on how it will define its’ culture and what will be the accepted norms for the team. Also the coach should help the team establish team goals and how the team will work to support and accomplish those goals. Conduct 1:1 goal setting and performance review sessions to help wrestlers reach their full potential by encouraging and pushing them to set SMART goals. Actively recruit kids to the wrestling team (not just football players) in order to build and strengthen the team. There are plenty of kids who have never played a sport who would make great wrestlers provided they are properly introduced to it. Start a club program if you have the resources and time and build a grassroots program that will feed into the junior high and high school program. If you don’t have time to start and or run a wrestling club, then support local area wrestling clubs who have an interest in helping your wrestlers get better. Organize scrimmage matches and or joint practices with neighboring schools if feasible. When I was a resident Greco-Roman athlete at the Olympic Training Center from 2001-2004, we often had coordinated practices with other national teams, national team members and even international teams who came to train with us. At any given time 3-5 of the top eight ranked wrestlers in the U.S. per weight class were in the room training alongside each other and training together. In closing, I hope to convey that even when no one else cares about what you are passionate about and, or your success is partially dependent on them caring, all is not lost. One must look for ways to overcome the hurdles that impedes success. Wrestlers, parents and coaches (especially on the junior high and high school level) all have a responsibility for shaping the culture and accepted norms of the team.